An aneurysm is a balloon-like bulge of an artery wall. As an aneurysm grows it puts pressure on nearby structures and may eventually rupture. Most people find out they have an unruptured aneurysm by chance during a scan for some other problem. The risk of rupture varies depending on the aneurysm location and size. Treatment options include observation, clipping, coiling, flow diversion, or bypass. To understand aneurysms, it is helpful to know how blood circulates to the brain (see Anatomy of the Brain). Blood is pumped from the heart and carried to the brain by two paired arteries, the internal carotid arteries and the vertebral arteries (Fig. 1). The internal carotid arteries supply the anterior (front) areas and the vertebral arteries supply the posterior (back) areas of the brain. After passing through the skull, the right and left vertebral arteries join together to form a single basilar artery. 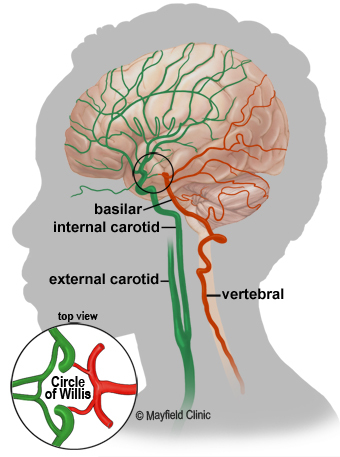 The basilar artery and the internal carotid arteries communicate with each other in a ring at the base of the brain called the Circle of Willis. Figure 1. The internal carotid arteries form the anterior (green) circulation and the vertebral / basilar arteries supply the posterior (red) circulation of the brain. About 80% of aneurysms arise in the anterior system; 20% form in the posterior. Most aneurysms arise on the Circle of Willis. What is an unruptured brain aneurysm? An aneurysm is a balloon-like bulge or weakening of an artery wall. (Similar to a balloon on the side of a garden hose.) As the bulge grows it becomes thinner and weaker. It can become so thin that the blood pressure within can cause it to leak or burst open — a life-threatening hemorrhage in the brain. The vast majority of aneurysms are silent, meaning they have no symptoms until they rupture. It is impossible to predict if and when an aneurysm may rupture, but when they do it can cause major disability and be fatal in 40% of people. On the other hand, many people die of old age with an aneurysm, but not because of it. So, not every aneurysm is at high risk of rupture. Saccular - (most common, also called "berry") the aneurysm bulges from one side of the artery and has a distinct neck at its base. Fusiform - the aneurysm bulges in all directions and has no distinct neck. Dissecting - a tear in the inner wall of the artery allows blood to split the layers and pool; often caused by a traumatic injury. Figure 2. A saccular aneurysm arises at the weak point of the artery where it branches. 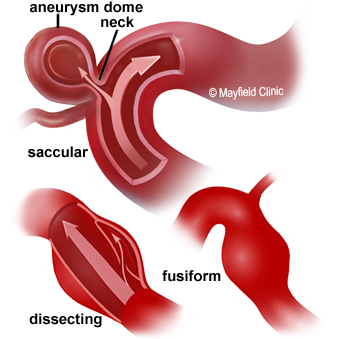 Other aneurysm types include dissecting and fusiform. The risk of aneurysm rupture is about 1% but may be higher or lower depending on the size and location of the aneurysm. Generally, the larger the aneurysm (>12mm), the higher risk of rupture. Also, aneurysms in the posterior circulation (basilar, vertebral and posterior communicating arteries) have a higher risk of rupture. Risk factors for rupture include smoking, high blood pressure, drug or alcohol abuse, atherosclerosis, and genetic factors (1, 2). Lifestyle changes can reduce your risk of rupture. Most aneurysms don't have symptoms until they rupture. Ruptured aneurysms release blood into the spaces around the brain called a subarachnoid hemorrhage (SAH). Unruptured aneurysms rarely show symptoms until they grow large or press on the brain or nerves. Rupture usually occurs while a person is active rather than asleep. If you experience the symptoms of a SAH, call 911 immediately! Studies have shown a strong link to family history (2). If an immediate family member has suffered an aneurysm, you are 4 times more likely to have one as well. The genetic link is not completely understood and studies are underway to determine if there is a pattern of inheritance. The most important inherited conditions associated with aneurysms include Ehlers-Danlos IV, Marfans syndrome, neurofibromatosis NF1, and polycystic kidney disease. For those with a strong family history of aneurysm in two or more blood relatives, we recommend a screening test with a CT or MR angiogram. About 2 to 3% of Americans may have or develop an aneurysm; of those, 15% have multiple aneurysms. Unruptured aneurysms are more common than ruptured (1). However, 85% of aneurysms are not diagnosed until after they bleed. Aneurysms are usually diagnosed between ages 35 to 60 and are more common in women. Most people find out they have an unruptured aneurysm by chance (incidental) during a scan for some other medical problem. If you are experiencing symptoms and your primary care doctor suspects an aneurysm, you may be referred to a neurosurgeon. The surgeon will learn as much about your symptoms, current and previous medical problems, current medications, family history, and perform a physical exam. Diagnostic tests are used to help determine the aneurysm's location, size, type, and involvement with other structures. Computed Tomography (CT) scan is a noninvasive X-ray to review the anatomical structures within the brain and to detect bleeding in or around the brain. CT angiography involves the injection of contrast into the blood stream to view the arteries of the brain. Angiogram is an invasive procedure, where a catheter is inserted into an artery and passed through the blood vessels to the brain. Once the catheter is in place, a contrast dye is injected into the bloodstream and the x-ray images are taken. Magnetic Resonance Angiography (MRA) scan is a noninvasive test, which uses a magnetic field and radio-frequency waves to give a detailed view of the soft tissues of your brain. An MRA involves the injection of contrast into the blood stream to examine the blood vessels, as well as the soft tissues of the brain. Deciding how, or even if, to treat an unruptured aneurysm involves weighing the risks of rupture versus the risks of treatment. In addition to size and location of the aneurysm, your overall health and medical history must be considered. Generally, the larger the aneurysm, the higher risk of rupture. The neurosurgeon will discuss with you all the options and recommend a treatment that is best for your individual case. Sometimes the best treatment may be to simply watch the aneurysm over time and reduce your risk of rupture. You should quit smoking, and control high blood pressure. Aneurysms that are small, unruptured, and asymptomatic may be observed with imaging scans every year until the growth or symptoms necessitate surgery. Observation may be the best option for patients with other health conditions. Clipping is an open surgery performed under general anesthesia. An opening is cut in the skull, called a craniotomy. The brain is gently retracted so that the artery with the aneurysm may be located. 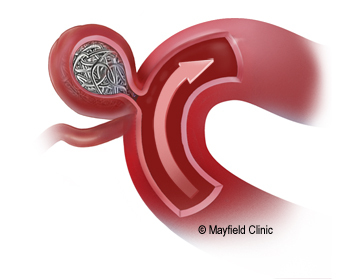 A small clip is placed across the neck of the aneurysm to block the normal blood flow from entering the aneurysm (Fig. 3). The clip is made of titanium and remains on the artery permanently. Recovery time typically is four to six weeks, but symptoms may last longer. 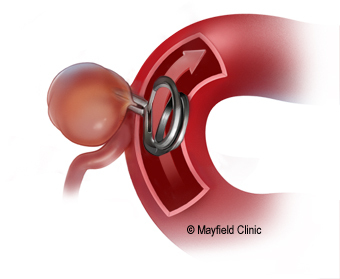 Figure 3: A titanium clip is placed across the neck of an aneurysm so that the blood flows through the artery, but not the aneurysm. If the aneurysm is large and inaccessible or the artery is too damaged, the surgeon may perform a bypass surgery. A craniotomy is cut to open the skull and clips are placed to completely block off (occlude) the artery and aneurysm. The blood flow is then rerouted (bypassed) around the occluded artery by inserting a vessel graft . The graft is a small artery, usually taken from your leg, which is connected above and below the blocked artery so that blood flows through the graft. Another method is to detach a donor artery from its normal position on the scalp and connect it above the blocked artery inside the skull. This is called a STA-MCA (superficial temporal artery to middle cerebral artery) bypass. Recovery time typically is four to six weeks, but symptoms may last longer. In contrast to open surgery, a minimally invasive option is endovascular coiling. It is performed during an angiogram in the radiology department. During a coiling procedure, a catheter is inserted into an artery in the groin and then passed through the blood vessels to the aneurysm in the brain. The doctor guides the catheter through the bloodstream while watching an x-ray monitor. Through the catheter, the aneurysm is packed with a basket of platinum coils. The coils induce clotting (embolization), which seals off the aneurysm and prevents blood from entering (Fig. 4). Recovery time typically is two to four days. Follow-up imaging is performed periodically for 5 years to confirm the coils have not compacted and the aneurysm is not regrowing. Figure 4. The aneurysm is packed with platinum coils. The coils induce clotting (embolization), which seals off the space and prevents blood from entering the aneurysm. If clipping or coiling would be difficult due to the shape, size, or wide neck of the aneurysm, a flow diversion stent may be used. 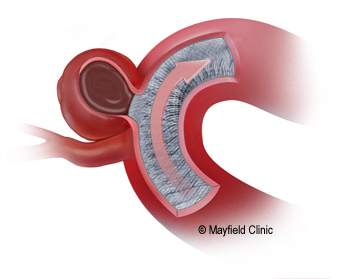 A flow-diverter is a tightly woven mesh tube placed inside the parent artery across the aneurysm (Fig. 5). Because blood cannot easily get through the spaces of the tight mesh stent, the blood flows inside the flow-diverter and continues down the artery without going into the aneurysm. Without the pulsating blood flow, the aneurysm will eventually clot off and shrink. Recovery time typically is two to four days. Figure 5. A flow-diverter mesh stent is placed inside the artery to reduce blood flow from entering the aneurysm. The aneurysm will eventually clot off and shrink. Should the aneurysm be treated? Unruptured aneurysm patients recover from surgery or endovascular treatment much faster than those who suffer a SAH. The possibility of having a second bleed is 35% within the first 14 days after the first bleed. This is why neurosurgeons prefer to do direct surgical or endovascular treatment as soon as the aneurysm is diagnosed, so that the risk of a rebleed is lessened. Aneurysm patients may suffer short-term and/or long-term deficits as a result of a treatment or rupture. Some of these deficits may disappear over time with healing and therapy. Wiebers DO: Unruptured intracranial aneurysms  risk of rupture and risks of surgical intervention. N Engl J Med 339:1725-33, 1998. Thompson BG: Guidelines for the management of patients with unruptured intracranial aneurysms. Stroke 46:2368-2400, 2015.
coiling: a procedure to insert platinum coils into an aneurysm; performed during an angiogram. Ehlers-Danlos IV: a genetic disorder of the connective tissue in the intestines, arteries, uterus, and other hollow organs that may lead to organ or blood vessel rupture. embolization: inserting material, coil or glue, into an aneurysm so blood can no longer flow through it. Marfans syndrome: a genetic disorder in which patients develop skeletal defects in long bones, chest abnormalities, curvature of the spine, and circulatory defects. neurofibromatosis (NF1): a genetic disorder, also called von Recklinghausen disease, in which patients develop café-au-lait spots, freckling, and multiple soft tumors under the skin and throughout the nervous system. polycystic kidney disease: a genetic disorder in which patients develop multiple cysts on the kidneys; associated with aneurysms of blood vessels in the brain. subarachnoid hemorrhage (SAH): bleeding in the space between the brain and skull; may cause a stroke. Each year Mayfield Brain & Spine treats nearly 400 people with life-threatening unruptured brain aneurysms. Dr. Andrew Ringer discusses unruptured intracranial aneurysms and the treatment options. Tri-State Brain Aneurysm Support Group meets the first Wednesday of every month. Visit www.TSBAconnex.org or call (513) 569-5346.